When the leaders of Canada, Mexico, and the United States met in Texas recently they underscored the deep ties and shared principles of the three countries. 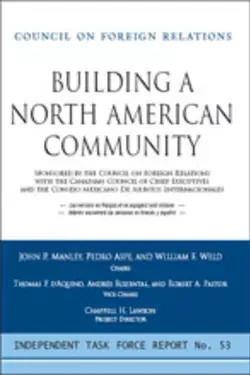 The Council-sponsored Task Force applauds the announced “Security and Prosperity Partnership of North America,” but proposes a more ambitious vision of a new community by 2010 and specific recommendations on how to achieve it. PEDRO ASPE is CEO of Protego, a leading investment banking advisory firm in Mexico. Mr. Aspe was most recently the Secretary of the Treasury of Mexico (1988-1994). He has been a Professor of Economics at Instituto Tecnologico Autonomo de Mexico (ITAM) and has held a number of positions in the Mexican government. THOMAS S. AXWORTHY is the Chairman of the Centre for the Study of Democracy at Queen's University. From 1981 to 1984, Dr. Axworthy was Principal Secretary to the Prime Minister of Canada, Pierre Trudeau. Since 2001, he has served as Chairman of the Asia Pacific Foundation of Canada. NELSON W. CUNNINGHAM is Managing Partner of Kissinger McLarty Associates, the international strategic advisory firm. He advised John Kerry's 2004 presidential campaign on international economic and foreign policy issues, and previously served in the Clinton White House as Special Adviser to the President for Western Hemisphere Affairs. He earlier served as a lawyer at the White House, as Senate Judiciary Committee General Counsel under then-chairman Joseph Biden, and as a federal prosecutor in New York. THOMAS P. D'AQUINOIS is Chief Executive of the Canadian Council of Chief Executives (CCCE), composed of one-hundred-fifty chief executives of major enterprises in Canada. A lawyer, entrepreneur, and business strategist, he has served as Special Assistant to the Prime Minister of Canada and Adjunct Professor of Law lecturing on the law of international trade. He is the Chairman of the CCCE's North American Security and Prosperity Initiative launched in 2003. ALFONSO DE ANGOITA is Executive Vice President and Chairman of the Finance Committee of Grupo Televisa, S.A. In addition, he has been a member of the Board of Directors and of the Executive Committee of the company since 1997, and served as Chief Financial Officer (1999-2003). Prior to joining Grupo Televisa, S.A., he was a partner of the law firm of Mijares, Angoitia, Cortes y Fuentes, S.C., in Mexico City. LUIS DE LA CALLE PARDO is Managing Director and founding partner at De la Calle, Madrazo, Mancera, S.C. He served as Undersecretary for International Trade Negotiations in Mexico's Ministry of the Economy and negotiated several of Mexico's bilateral free trade agreements and regional and multilateral agreements with the World Trade Organization. As Trade and NAFTA Minister at the Mexican Embassy in Washington, DC, he was instrumental in crafting and implementing the North American Free Trade Agreement. WENDY K. DOBSON is Professor and Director, Institute for International Business, Rotman School of Management, University of Toronto. She has served as President of the C.D. Howe Institute and Associate Deputy Minister of Finance in the government of Canada. She is Vice Chair of the Canadian Public Accountability Board and a nonexecutive director of several corporations. RICHARD A. FALKENRATH is Visiting Fellow at the Brookings Institution. Previously, he served as Deputy Homeland Security Adviser and Special Assistant to the President and Senior Director for Policy and Plans at the White House's Office of Homeland Security. He is also Senior Director of the Civitas Group LLC, a strategic advisory and investment services firm serving the homeland security market, a security analyst for the Cable News Network (CNN), and a member of the Business Advisory Board of Arxan Technologies. RAFAEL FERNANDEZ DE CASTRO is the founder and head of the Department of International Studies at the Instituto Tecnologico Autonomo de Mexico (ITAM). Dr. Fernandez de Castro is also the editor of Foreign Affairs en Espanol, the sister magazine of Foreign Affairs. He also has columns in Reforma and the weekly magazine Proceso. RAMON ALBERTO GARZA is President and General Director of Montemedia, a consulting firm specializing in media, public image, entrepreneur relations, and politics in the Americas. He was the founding Executive Editor of Reforma and President of Editorial Televisa. GORDON D. GIFFIN is Senior Partner at McKenna Long & Aldridge LLP, and served as U.S. Ambassador to Canada (1997-2001). He also spent five years as Chief Counsel and Legislative Director to U.S. Senator Sam Nunn. He currently serves on several major corporate boards, as well as the Board of Trustees of the Carter Center, in addition to his international law practice. ALLAN GOTLIEB was Canadian Ambassador to the United States, Undersecretary of State for External Affairs, and Chairman of the Canadian Council. He is currently a senior adviser to the law firm Stikeman Elliott LLP, and Chairman of Sotheby's Canada and the Donner Foundation. He has also been a member of the board of a number of Canadian and U.S. corporations, taught at various universities in both countries, and written several books and articles on international law and international affairs. MICHAEL HART holds the Simon Reisman Chair in trade policy in the Norman Paterson School of International Affairs at Carleton University in Ottawa. He is a former official in Canada's Department of Foreign Affairs and International Trade, founding director of Carleton's Centre for Trade Policy and Law, and the author of more than a dozen books and a hundred articles on Canadian trade and foreign policy. CARLOS HEREDIA is Senior Adviser on International Affairs to Governor Lazaro Cardenas-Batel of the State Michoacan. He has held senior positions in the Ministry of Finance and the Mexico City government. For over twenty years, he has worked with Mexican, Canadian, and U.S. nongovernmental organizations, promoting economic citizenship and participatory development. Since 2002, he has been Vice President of the Consejo Mexicano de Asuntos Internacionales (COMEXI). CARLA A. HILLS is Chairman and CEO of Hills & Company, an international consulting firm providing advice to U.S. businesses on investment, trade, and risk assessment issues abroad, particularly in emerging market economies. She also serves as Vice Chairman of the Council on Foreign Relations. From 1989 to 1993, Ambassador Hills served as U.S. Trade Representative in the first Bush administration, Secretary of the U.S. Department of Housing and Urban Development, and Assistant Attorney General, Civil Division, U.S. Department of Justice in the Ford administration. PIERRE MARC JOHNSON is a former Premier of Quebec, attorney, and physician, and has also been Counsel to the law offices of Heenan Blaikie since 1996. He was a senior member of Rene Levesque's cabinet (1976-85) and succeeded Mr. Levesque. Since 1987, Mr. Johnson has been Professor of Law at McGill University and an adviser to the United Nations in international environmental negotiations. He has written numerous books and essays on trade and the environment, civil society participation, and globalization. He lectures in Canada, the United States, and Mexico, and serves on Canadian and European boards. JAMES R. JONES is CEO of Manatt Jones Global Strategies, a business consulting firm. Formerly, he was U.S. Ambassador to Mexico (1993-97), President of Warnaco International, Chairman and Chief Executive Order of the American Stock Exchange, and U.S. Congressman from Oklahoma from 1973 to 87 (D-OK), where he was Chairman of the House Budget Committee. He was Appointments Secretary (currently known as Chief of Staff) to President Lyndon B. Johnson. He is Chairman of Meridian International and the World Affairs Councils of America, and is a board member of Anheuser-Busch, Grupo Modelo, Keyspan Energy Corporation, and the Kaiser Family Foundation. CHAPPELL H. LAWSON is a Project Director of this Task Force, and is also an Associate Professor of political science at MIT, where he holds the Class of 1954 Career Development Chair. Before joining the MIT faculty, he served as Director for Inter-American Affairs on the National Security Council. JOHN P. MANLEY is Senior Counsel at McCarthy Tetrault LLP. He has held several senior portfolios in the Canadian government throughout his fifteen years of public service -- including industry, foreign affairs, and finance -- as well as holding the position of Deputy Prime Minister. Following 9/11, he was named Chairman of the Public Security and Anti-terrorism Cabinet Committee and, in that capacity, negotiated the Smart Border Agreement with U.S. Secretary for Homeland Security Thomas Ridge. DAVID McD. MANN, Q.C., is Counsel at Cox Hanson O'Reilly Matheson, an Atlantic-Canadian law firm. He is the former Vice Chairman and former President and CEO of Emera Inc., a diversified investor-owned energy and services company. DORIS M. MEISSNER is Senior Fellow at the Migration Policy Institute (MPI) in Washington, DC. She has worked in the field of immigration policy and international migration for 30 years in both government and policy research organizations. She served as a senior official in the U.S. Department of Justice during the Nixon, Ford, Carter, and Reagan administrations, and as a senior associate at the Carnegie Endowment for International Peace. She returned to government during the Clinton years as Commissioner of the U.S. Immigration and Naturalization Service (INS) from 1993-2000. THOMAS M.T. NILES is Vice Chairman of the United States Council for International Business (USCIB). He retired from the U.S. Foreign Service in September 1998, following a career of more than thirty-six-years and having served as Ambassador to Canada (1985-1989), Ambassador to the European Union (1989-1991), Assistant Secretary of State for Europe and Canada (1991-1993), and Ambassador to Greece (1993-1997). BEATRIZ PAREDES serves as President of the Fundacion Colosio, A.C. Ms. Paredes is a former Ambassador of Mexico to the Republic of Cuba and former Governor of the State of Tlaxcala (1987-92). She was the first female Governor of that state and only the second woman ever to be elected Governor in Mexico. She is also a former Speaker of the House of Representatives. ROBERT A. PASTOR is Director of the Center for North American Studies, Vice President of International Affairs, and Professor at American University. From 1977 to 1981, he was Director of Latin American Affairs on the National Security Council. He is the author or editor of sixteen books, including Toward a North American Community: Lessons from the Old World to the New. ANDRES ROZENTAL is President of the Consejo Mexicano de Asuntos Internacionales. Mr. Rozental was a career diplomat for more than thirty years, having served his country as Ambassador to the United Kingdom (1995-1997), Deputy Foreign Minister (1988-1994), Ambassador to Sweden (1983-1988), and Permanent Representative of Mexico to the United Nations in Geneva (1982-1983). During 2001, he was Ambassador-at-Large and Special Envoy for President Vicente Fox. LUIS RUBIO is President of the Centro de Investigacion Para el Desarrollo-Center of Research for Development (CIDAC), an independent research institution devoted to the study of economic and political policy issues. Before joining CIDAC, in the 1970s he was Planning Director of Citibank in Mexico and served as an adviser to Mexico's Secretary of the Treasury. He is also a contributing editor of Reforma. JEFFREY J. SCHOTT is Senior Fellow at the Institute for International Economics. He was formerly an official of the U.S. Treasury and U.S. trade negotiator, and has taught at Princeton and Georgetown Universities. He has authored or coauthored fifteen books on international trade, including NAFTA: Achievements and Challenges, NAFTA: An Assessment; North American Free Trade, and The Canada-United States Free Trade Agreement: The Global Impact. WILLIAM F. WELD is Principal at Leeds Weld & Co., a private equity investment firm in New York. Previously Mr. Weld was elected to two terms as Governor of Massachusetts (1991-1997), served as Assistant U.S. Attorney General in charge of the Criminal Division of the U.S. Department of Justice in Washington, DC (1986-1988), and as the U.S. Attorney for Massachusetts during the Reagan administration (1981-1986). RAUL H. YZAGUIRRE currently serves as the Presidential Professor of Practice at Arizona State University (Community Development and Civil Rights). Mr. Yzaguirre, who recently retired as President and CEO of the National Council of La Raza (NCLR) in Washington, DC (1974-2005), spearheaded the council's emergence as the largest constituency-based national Hispanic organization and think tank in the United States.